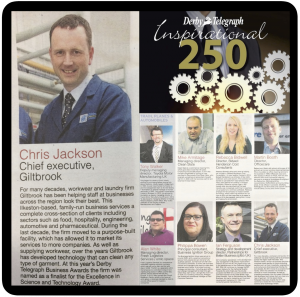 Giltbrook Workwear have had some good news, as part of their Inspirational 250 the Derby Telegraph have listed individuals from Derbyshire’s business community who are making an inspiring contribution to the economic prosperity of the area. We are pleased to say that our very own CEO was included which is a great honour for the company especially in our seventieth year. This year we have receved many kind reviews and has been a very positive anniversary having featured as a finalist at the business awards for science and innovation. We hope to continue the great work that has meant we have been recognised for our efforts this year. Giltbrook will continue to push the boundaries of innovation within the workwear and laundry industry. But above all we will continue to deliver an excellent service to all our current and prospective customers. We would like to thank the Derby Telegraph for including our CEO in the magazine. Find out more about our history and our service here or get in touch with one of our friendly team.